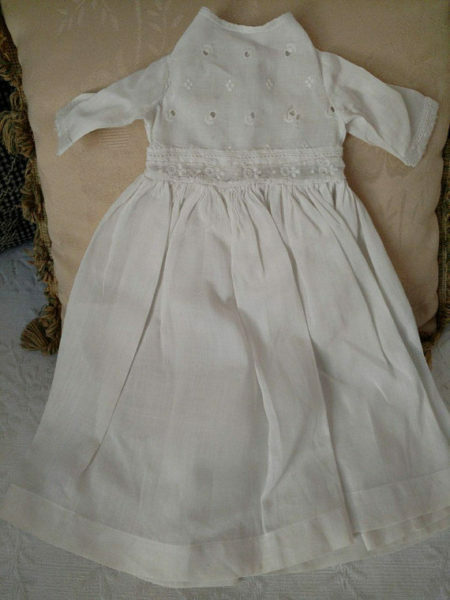 Here is a sweet little white cotton doll dress. Victorian or Edwardian in style, however, although vintage, It may or may not be as old as the 1900’s. The bodice is made of white eyelet with a tiny narrow trim lace around the neck line. Long sleeves with whitework to form the cuff. Skirt is full, made in a white batiste cotton fabric. Waist band is trim in whitework embroidery. Buttons with three pearl buttons down the back to the waist. It is machine sewn and is nicely made. It would look quite lovely on an old bisque doll though.